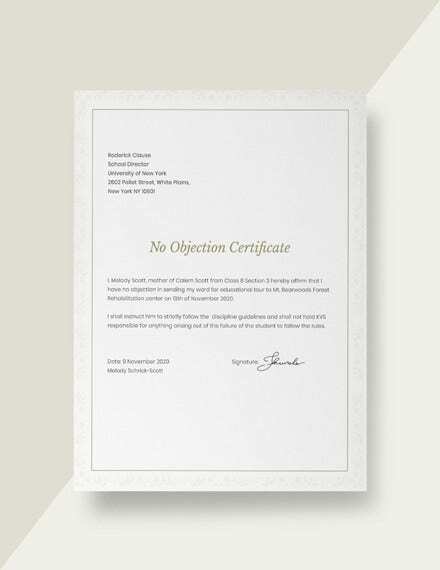 A No Objection Certificate is a document of concrete or obvious evidence. The author of the document often has no objection to what they are writing, which means that the content of the file is legal, precise, and unquestionable. 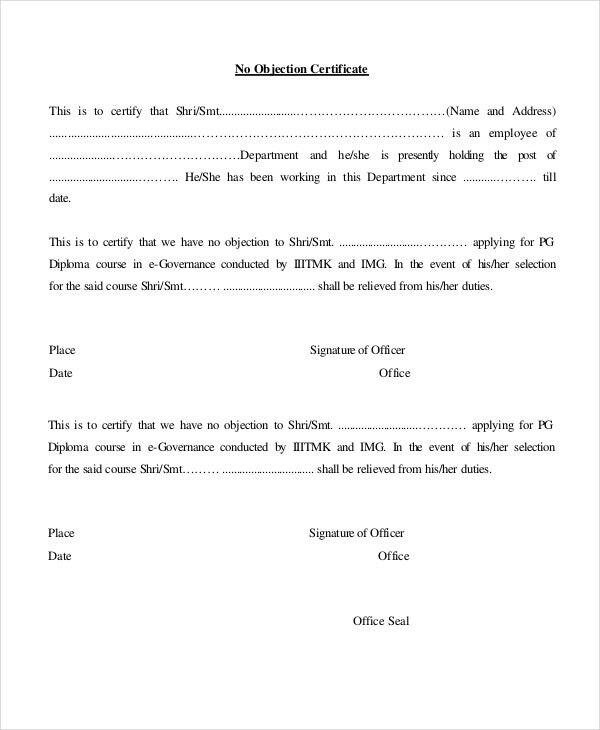 For example, when an employee is leaving one company to seek work in a different agency, the management of the worker ‘s current firm should issue a No Objection Certificate Templates as an emblem that they do not have any objection to an employee’s decision to work for a different company altogether. 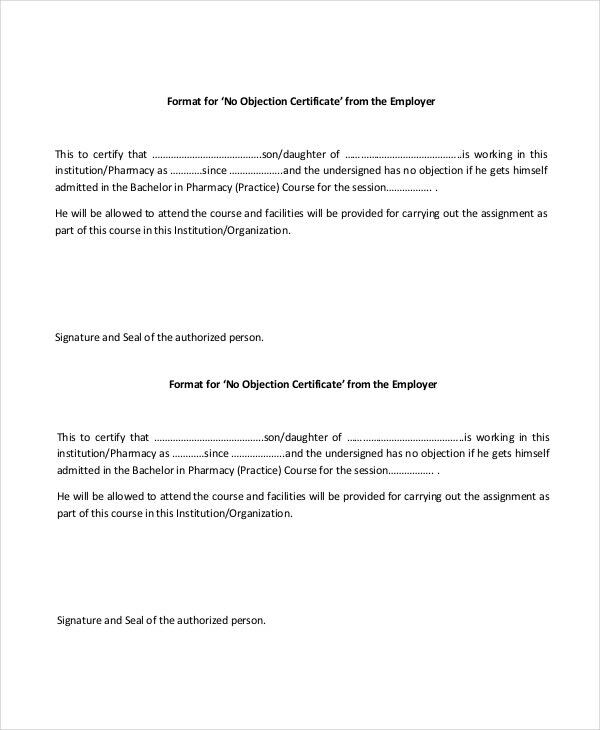 When a worker decides to leave a company, an employer has the mandate to issue him/her a certificate of No Objection. 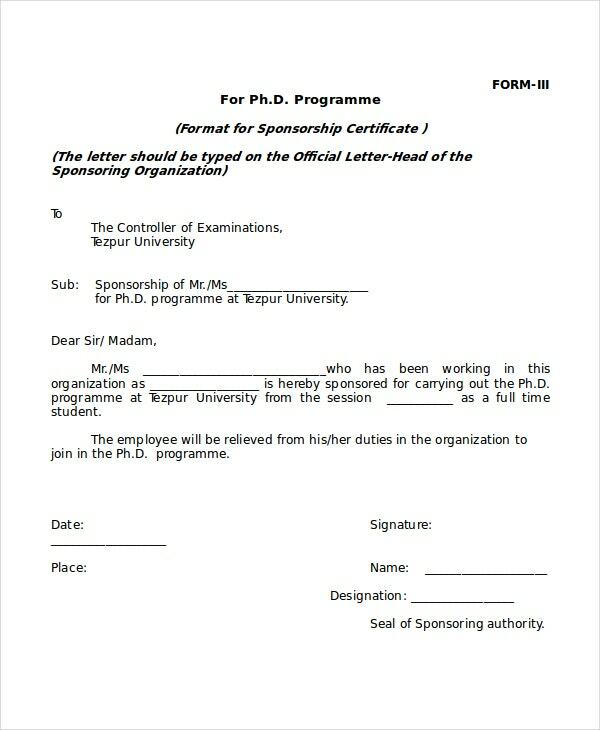 You can use this template to prepare the certificate. 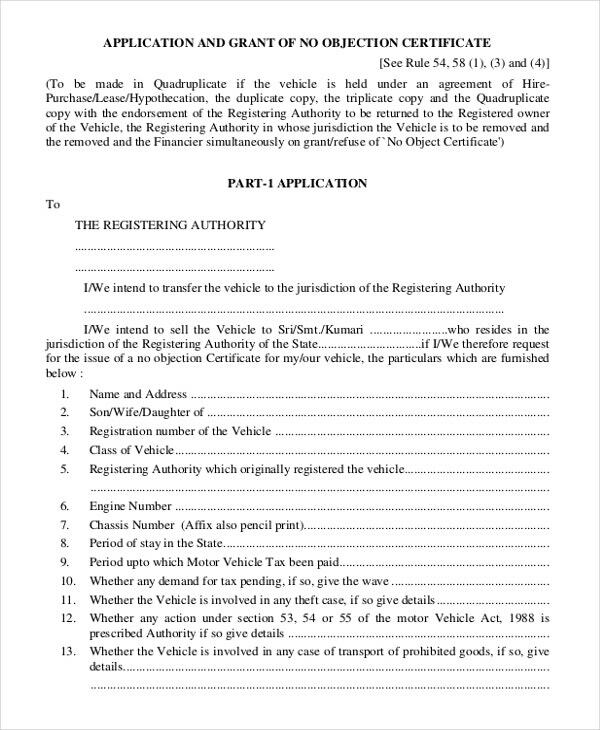 You may also see Medical Certificate Templates. 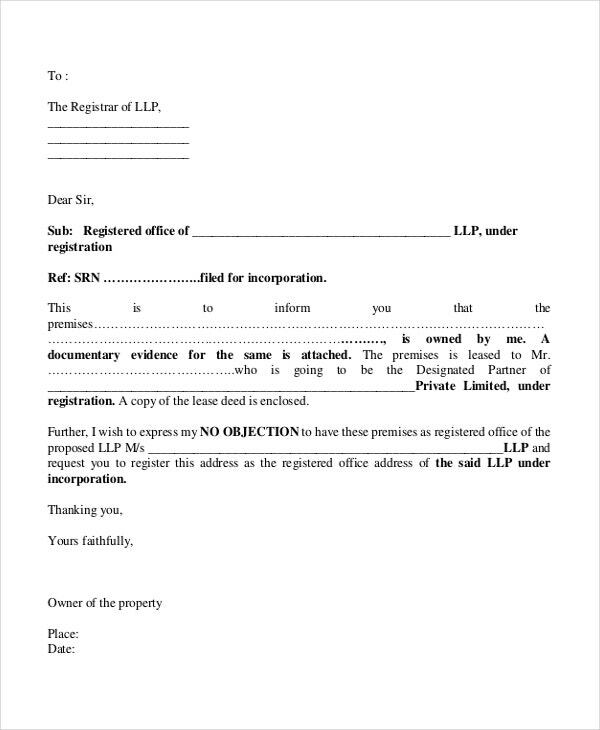 The No Objection Certificate for permission is a letter sample indicating that the holder of the certificate has legal permission from their senior, and the authority has no objection to the permission granted. 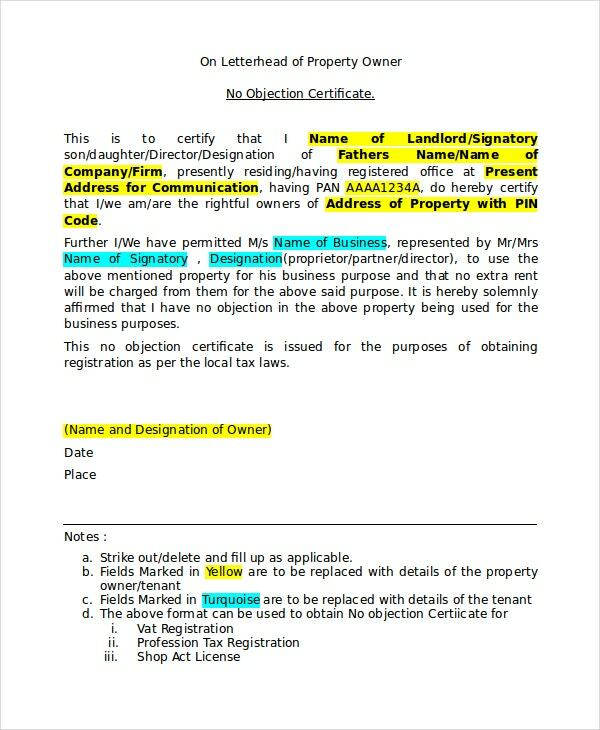 The certificate template in word is for proprietors who would like to express their stand on the property that they own. The property owners often support the certificate with sufficient evidence. 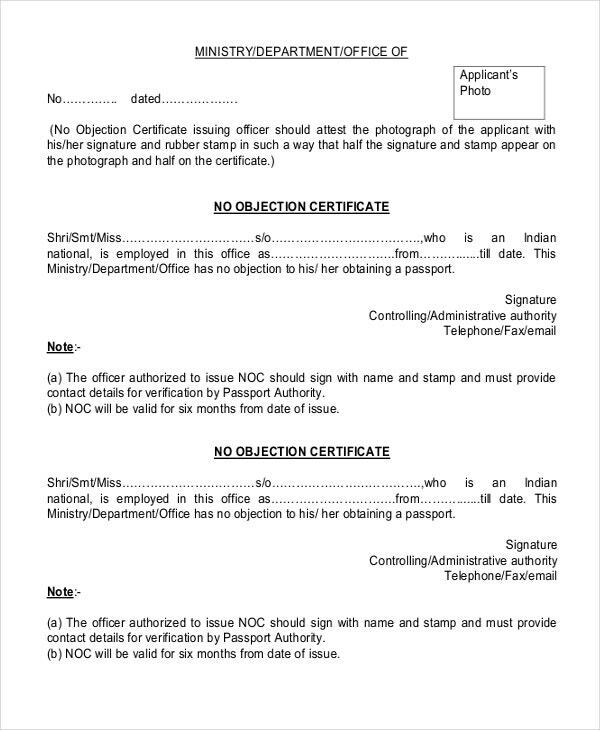 A passport holder needs to have a No Obligation Certificate for Passport. The document proves that the holder of the passport is the legal owner of the document and that there are no objections to the ownership evidence. You may also see PowerPoint Certificate Templates. 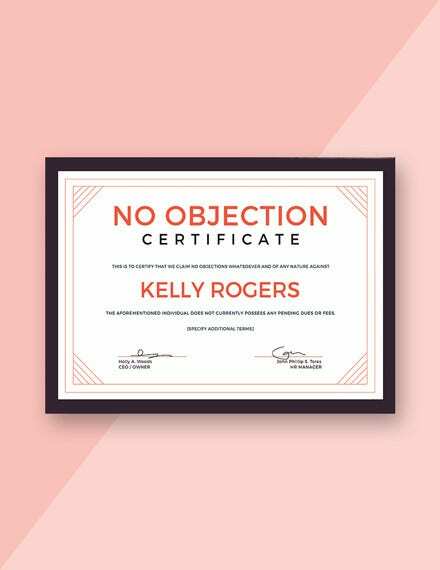 What is the Best Example Use of a No Objection Certificate? An employer often writes a No Objection certificate for an employee who has made it clear that they (employee) would like to work for another company. In this case, the No Objection document expresses the subjective and objective feelings that an employer has towards a worker, adding that they have no objection, whatsoever, to a member of staff who made the decision to move to a different company. The content of the certificates varies in length. Longer ones often talk more about the responsibilities of an employee in the previous company although that’s not always necessary. You may also see Training Certificate Templates. 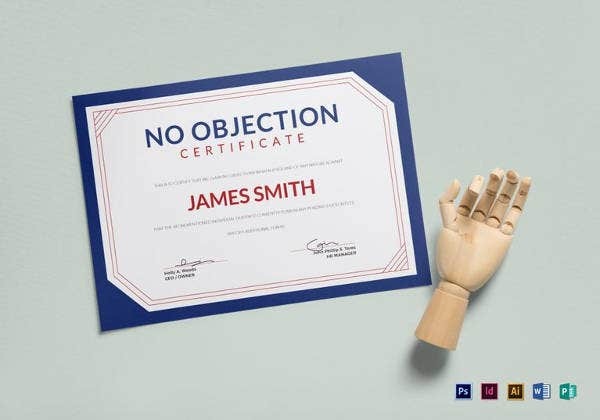 Who issues the No Objection Certificate? 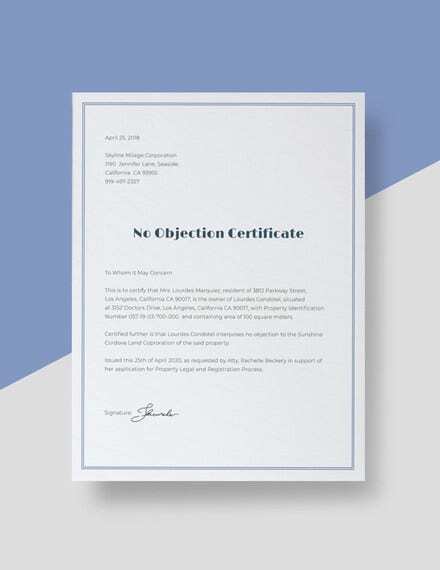 First, you need to understand that a No Objection Certificate is a necessary, formal letter, and that means that almost anyone can write the letter, except for some special instances. For example, once an employee writes a letter of intent to quit working for the current company to work for another enterprise. You may also see Share Stock Certificate Template. The member of staff can ask his/her boss to write them an NOC as an assurance that the employer does not have any objection against the decision that the employee has made. It is important to understand, though, that an employer can only prepare the certificate upon the request of an employee. 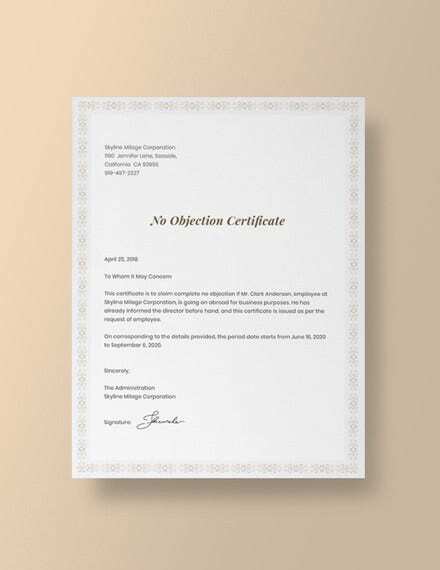 What does a No Objection Certificate or Letter Prove? 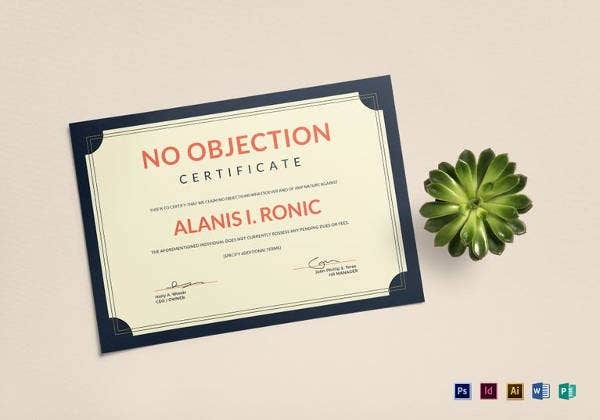 Again, because of the variation of the kind of people that can use this template, it only means that No Objections Certificate can prove different things depending on who uses the document. 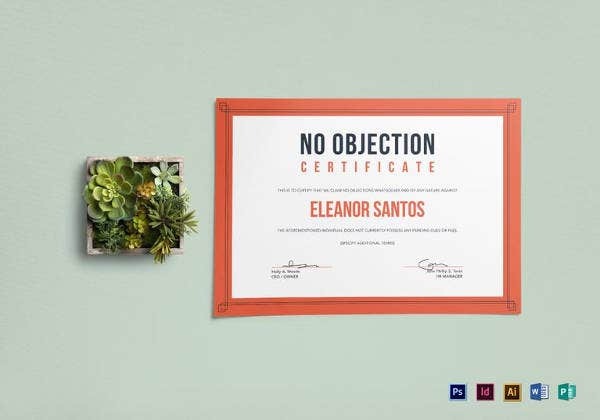 For example, a NO Objection Certificate for an employee proves that the employee is competent, and as such, he/she is more likely to be profitable for the organization that he/she will be working for in the future. 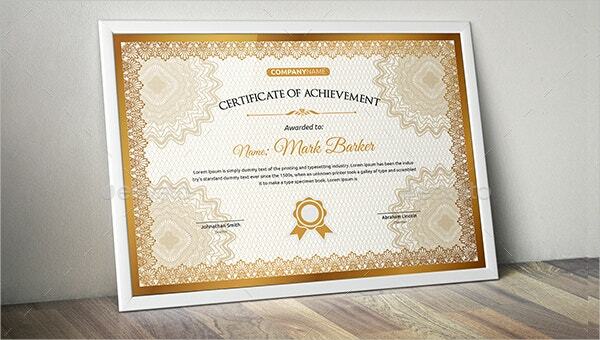 You may also see Free Downloadable Certificate Templates. 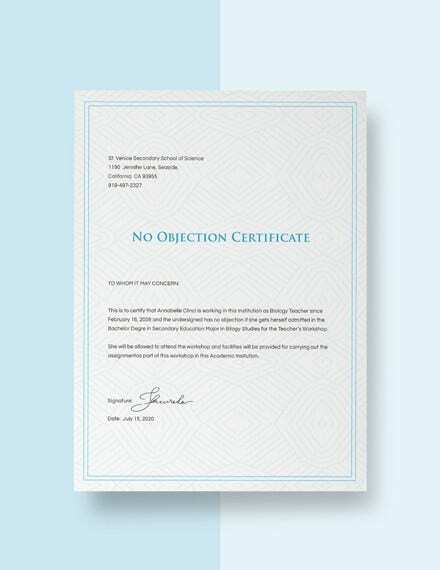 The No Objection Certificate Templates described in this article are free to download. Moreover, each template is 100% editable, which means you can easily customize the content. Moreover, feel free to edit each block of text if you want. At the end of the day, the template will save you time and money.